GW alumna and actress Kerry Washington addresses graduates and their families at Commencement on the National Mall.Kerry Washington didn’t expect to play a frog in a GW musical her junior year. And she didn’t expect to speak to about 7,000 graduates Sunday on a misty National Mall, perched in front of a scaffolded Washington Monument. In self-deprecating fashion, the award-winning actress and 1998 alumna admitted she wouldn’t have advice like one of the “esteemed leaders and thinkers” at previous Commencement ceremonies. Instead, she spoke to graduates as their peer, pushing them to take a leap into unexpected and intimidating situations. 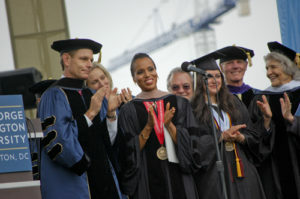 GW alumna and actress Kerry Washington addresses graduates and their families at Commencement on the National Mall. Washington told graduates how she overcame her apprehension about playing a frog in a GW musical director and embraced her self-crafted interdisciplinary major in the social sciences to perfect her role, heading to the National Zoo to study frogs. Washington, best known for her roles in “Ray,” “Django Unchained” and “Scandal,” delivered a speech that took graduates and their families through the steps of a hero’s journey, outlined by writer Joseph Campbell’s famous essay. The actress referenced the stories of the Class of 2013, highlighting students who founded a bipartisan political action committee and the work of graduates to advance the sciences and international development. “And because as your story unfolds, you will inspire others to find their stories. In fact, don’t be surprised if you get a call from me wanting to option the really good ones and turn them into movies because I’m so Hollywood now,” she joked. Washington also made sure to acknowledge her selection as Commencement speaker as a departure from recent picks, like politics and media stars Michelle Obama, Brian Williams, Rahm Emmanual and Michael Bloomberg. But the Bronx, N.Y. native charmed the graduating class, harkening back to she would drink at the local bar Lindy’s Red Lion and endure sleepless nights studying and preparing for student productions during her undergraduate years at GW. GW students, who were initially split over Washington’s selection, were happily surprised, screaming “I love you,” several times throughout her speech. Josh Rooks, who graduated from the School of Engineering and Applied Sciences, said he was originally slightly disappointed by the choice, but was impressed by her speech. Rooks said he was moved by “the way that she was talking about moving forward and pushing out of your comfort zone to become your own person,” as he prepares to move to Massachusetts in search of a job. Channeling his studies as a classics major, student speaker Alex Zafran reminded his fellow graduates that education, like in ancient Rome, is a bridge to a new chapter of self-discovery. Zafran, who hopes to earn an MBA and become an entrepreneur, praised his fellow graduates for devoting themselves to community service, political activism and a wide range of extracurricular activities. Zafran said after the speech that he he hopes graduates will continue learning after their time at GW. Adm. Thad Allen, an alumnus of GW’s master’s of public administration program, received another honorary degree and addressed graduates about the need for transparency and accountability in government. Allen challenged graduates to not shy away from leadership opportunities, but rather embrace adversity to discover the core of their character. After the ceremony, Allen said he hoped to motivate graduates to become leaders motivated by solving problems and not ideology. “Somebody’s got to step forward and say, we have to do things, we have to be transparent, we have to be honest. And even if it’s an adverse situation, someone’s got to do something – and that’s my charge,” he said. Harriet Fulbright, who earned a Master of Fine Arts from GW in 1975, also received an honorary degree. She is the president of the J. William & Harriet Fulbright Center and the Harriet Fulbright College. Her husband, alumnus Sen. J. William Fulbright, founded the world-famous grant program that operates in over 150 countries. And before the graduates flipped their tassels and threw their caps in the air, University President Steven Knapp delivered his own charge to graduates, directing them to stay curious and keep their dedication to service alive after graduating. “We depend on you to repair what earlier generations have broken, to build what we have left unbuilt, to learn what we have not yet learned, to heal what we have so far left unhealed,” he said.